It seems that the San Diego-based 3D film studio PassmoreLab has licensed a number of its latest 3D films to Nvidia for use on the 3DVisionLive.com online 3D community website, making accessible some of the movie studio’s extensive library of 3D video content available online. Of course you will be required to have 3D Vision-equipped desktop or mobile computer in order to be able to watch these movies online. The first seven titles are expected to be available online in April. 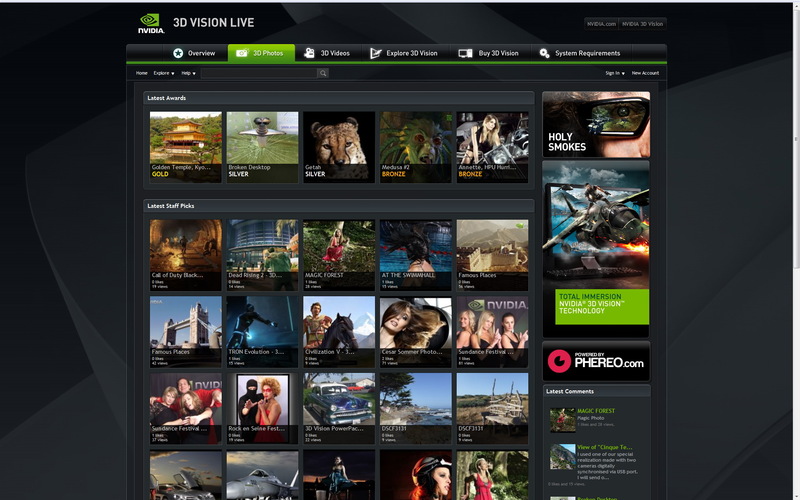 The 3DVisionLive.com website is an online community where users of Nvidia’s 3D Vision technology can enjoy and share a broad range of 3D content on their PCs. It allows them to stream 3D films, trailers, music videos, sport clips, and video shorts, as well as upload, share and view full-resolution 3D photos. Analysts estimate about 75M 3D PCs will be sold per year within five years. (Source: Jon Peddie Research, 75 million PCs in 2014). The 3D video part requires you to have the latest 3D Vision and GPU drivers as well as the Microsoft Silverlight plugin installed in order to be able to watch them streaming directly in the browser and not in full screen, without having to download the videos first. And if you have made a stereoscopic 3D video that you want to share, you can send an email to get in tough with the team managing the website to feature your video there. This functionality has already been available for some time, but recently a lot of new 3D video content has been added, so if you haven’t checked it lately, then you should go and take a look. On the other hand, the new 3D photo functionality that is being introduced today is much more advanced and user friendly in the term that you can register a free account and upload directly your 3D photos. And if you just want to browse, you can do so, just make sure you have the latest R265 drivers (266.35 beta) that are just released in order to get the new functionality that will allow you to see the 3D photos in 3D directly inside the web browser. Without this driver you will get a warning that something is missing instead of the photo being shown as on the image above. Besides sharing your 3D photos and browsing the 3D photos of other users, you can also rate and comment them. You also have the ability to create albums with the option for them being public or private. Also when uploading the photos you have control over what is format you have the photos in like if it is two separate files for the left and right, if it is in parallel or crossyed viewing format, if it is in MPO file format etc. You can also upload in anaglyph format, but I would not recommend that as the player on the website can do the conversion to anaglyph on the fly. And by uploading in anaglyph format you will be limiting the viewing options only to anaglyph format. Currently, as the 3D photos part is just announced, there are not that many great 3D photos, mostly pictures made and uploaded by Nvidia, some from games in stereo 3D mode, and you can also find some new and interesting 3D pictures from Cesar Sommer. But you can quickly join in and share some nice 3D photos you’ve made in order to significantly increase the number of photos available, I’ll do so with some 3D photos I’ve taken with my Fujifilm Real 3D W1 camera. Aside from being able to watch the photos in stereo 3D mode directly in your browser using 3D Vision, you are also able to see them in Anaglyph red-cyan mode if you have a pair of anaglyph glasses with this widely used color filter combination. This, although not providing so good experience as 3D Vision, will also allow you to enjoy the photos in 3D. Besides in the smaller traditional view, you also have the option to get the photo displayed with bigger size, but not in full screen (by hitting the magnifying glass button). Just a reminder that for the anaglyph mode you will not need to have specific hardware or software installed, besides the anaglyph glasses. The new release 265 drivers are required only in order to use the 3D Vision mode inside the browser window (not in full screen), so do not forget to also download and install them! Nvidia will showcase 3DVisionLive.com at CES 2011, January 6-9, in Las Vegas (Booth # 31431 – Las Vegas Convention Center, South Hall 3). In addition they will also be announcing and demonstrating a number of new 3D Vision-equipped PCs, displays and other devices at CES, including the first 3D Vision-enabled all-in-one PC, the ASUS All-in-One PC ET2400XVT, which is now available at select online retailers. So if you are visiting CES this year, then you should take a look at Nvidia’s booth for some interesting things. Apparently Nvidia’s video portal with streaming 3D videos is now finally out of beta and has more 3D videos available for watching directly online from your browser’s window, so you can go and check out the new content available. Of course you will need to have 3D Vision-equipped PC and Microsoft’s Silverlight plugin as well as the latest video drivers installed in order for things to work as they should. And if you are making 3D videos, then you are welcome to drop a line to Nvidia (they have a contact email on the website) to get your video included. And apart from Nvidia’s website, you can also get your 3D videos featured here on the 3D Vision Blog if you get in contact with me using the contact form above.